8 Guests 1 Member 9 Bots (+54 bot dupes) 1 spammer also just said hi. Hey guys. 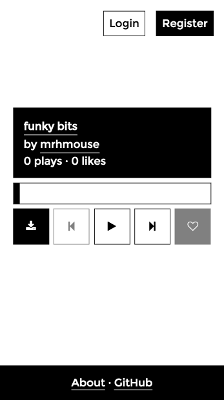 A few weeks ago I wanted a way to listen to sequential songs on here, as well as an easier way to discover random new tunes. 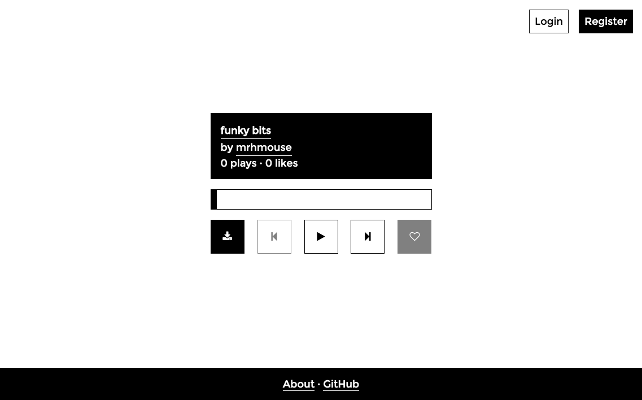 So I made a ChipMusic web app. I hope this was OK. I was mostly just scratching my own itch and I'm hoping I didn't step on any toes in the process. This wouldn't have been able to get off the ground at all if this site didn't have such an amazingly complete RSS feed, or songs licensed under CC. You guys all rule. I'll write a blog post later about how I made it if anyone's interested in that. Mostly just vanilla JS and Firebase. If you find any problems please post ITT. It's a bit janky right now but has all the basic features. If you use Chrome on Android you can install it to your homescreen for a better experience, too. Very cool idea. I approve. I dig it. Maybe add an automatically starting next song function, instead of having to press play. I still like the cmo style, because of most recent at top, and search function, but this other way is really cool. Options are nice. Thanks so much guys! Your posts are super encouraging. I dig it. Maybe add an automatically starting next song function, instead of having to press play. It does on desktop, but mobile browsers have a restriction around it. But I have a workaround that's almost ready that will get around it. hey this is a really great idea! my tunes aren't creative commons (yet) but please include them! This is great! Needs autoplay, and volume controls. Maybe a way to keep the volume of all the songs similar automatically, like the smart sound feature on tvs? Protip: there are keyboard shortcuts. Shift+D to download, ← to skip back, Space to play/pause, → to skip forward, Shift+L to like, and V to view the current song on ChipMusic.org. Once again thank you for all the comments. I'm super excited people like this and are using it. ah ok! so it should work if i remove them and re-submit under the new license? If you make them CC here I can manually make that change on CM.fm for you, no need to resubmit if you don't want. So happy to hear it's been useful for you.